With A major cold front has been moving through the everglades, dropping the morning temps into the low 40’s. Today, we decided to head deep into the backcountry and fish the deep creeks where the water is warmer . We arrived at the first spot and it didn’t take long before we were hooked with a nice size redfish, that couldn’t resist a riptide jig tip with a piece of shrimp. As the rest of the morning went on, we scored with a nice mix of fish that included trout , sheepshead , black drum , gag grouper and a nice Goliath grouper . 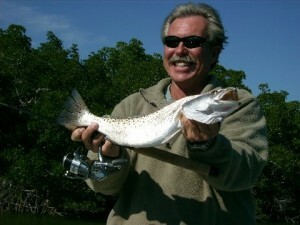 Despite the cold weather, the fishing in the Everglades was good, providing us with some nice sized fish . If you would like to get out on the water and get into some great action, give me a call!